I found this in Rachael Ray's magazine. It was really easy to make and I customized it to my own tastes. For example, the original recipe had cannellini beans in it. We didn't have any and I don't particularly like them anyway. I'm like that I guess. While I used to LOVE watching Rachael Ray, I realized that the only way I could make her recipes was to cut out the beans (I only really enjoy black beans)...sausage...expensive cheeses that I flat out refuse to buy...etc. But this is good! Don't skip the real lemon juice. It's what gives the soup the fresh flavor. Cook the orzo for 8-10 minutes in salted boiling water. Drain and set aside. Cook the chicken in a soup pot, then add the vegetables and cook until tender. Stir in the orzo, broth, lemon juice, and season to taste. 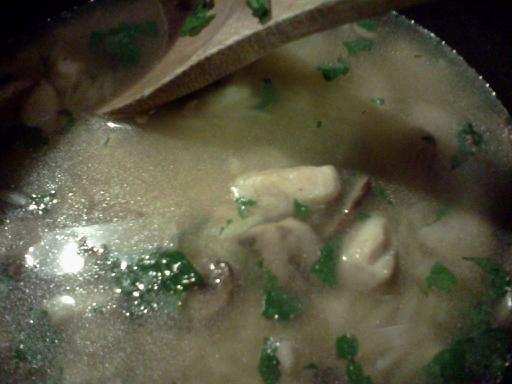 Let it simmer together until heated through, then stir in the parsley.